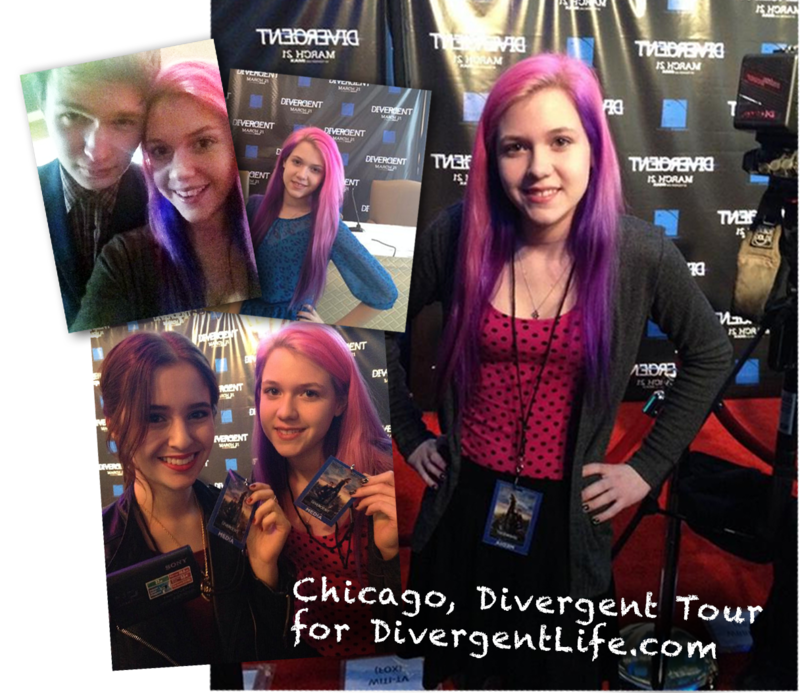 DivergentLife attended the Chicago Divergent Tour Event thanks to Sylvia, who became our correspondent. 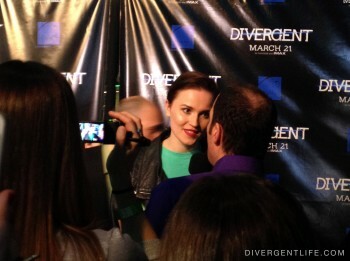 We've known Sylvia since the early days of Divergent filming, she's a big fan and would often go check out the sets, cheer on the cast, and send us updates! "WOW! 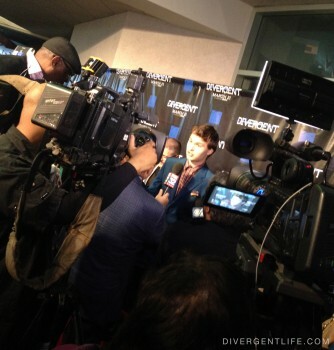 I don’t even know where to begin when describing my experience at the Divergent red carpet and movie screening event. I live about 30 minutes away from the theater, so it was a pretty short trip compared to those who came from other states. My older sister, who is also a divergent fan, and I drove to the theater and arrived around 5:00 pm. 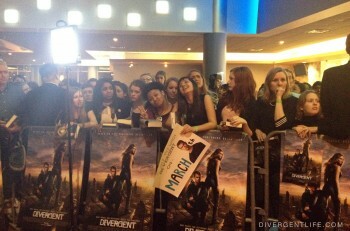 Upon arrival, I got in the press line where I found some of my other friends who were also doing press. 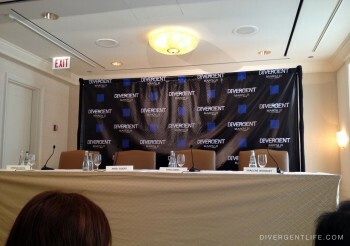 At about 6:00 pm, they started letting the press in to set up. 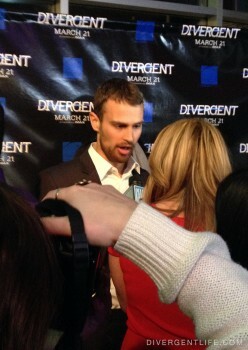 The site I was representing, DivergentLife.com, had paired up with the site PageToPremiere, which my friend Sasha was representing on the red carpet. 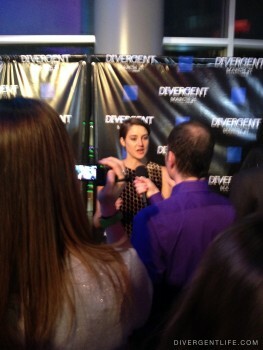 The red carpet was sort of shaped like a circle, with the press in the center. 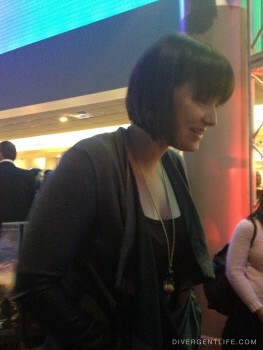 The spot I was assigned to stand at was facing the fans with the red carpet backdrop behind us. After more than an hour of waiting, the stars began to come out on the red carpet. First was Chicago mayor Rahm Emanuel, who seemed very proud to have such a big movie filmed in his city. 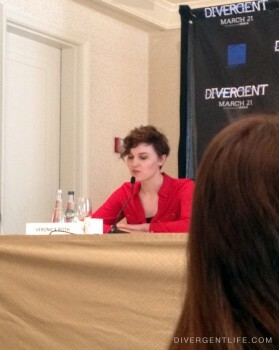 Next was Amy Newbold, who plays the initiate transfer Molly in the movie. 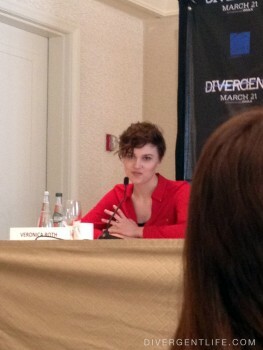 She is a really sweet person and in our interview, she talked about her audition process and her favorite scenes. 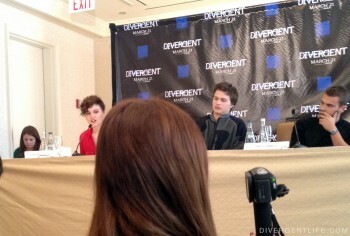 While Amy was still making her way around the press, Ansel Elgort, who plays Caleb, and Veronica Roth, the author of the trilogy, came out. 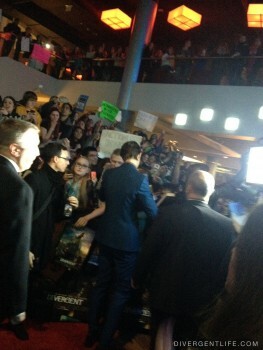 Fans went crazy as soon as they came out, some shrieking at the top of their lungs! 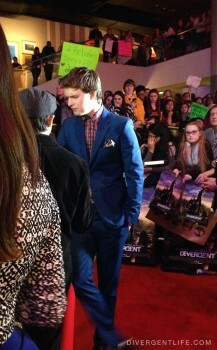 Ansel was wearing a blue Prada blazer, looking very Erudite, like his character in the movie. 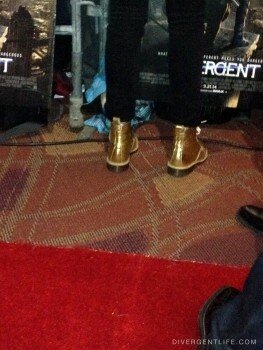 Veronica was sporting some fun gold Dr Martens. The second interview Sasha and I did was with Veronica, in which she talked about upcoming projects, writing from Four’s point of view, and finishing off her trilogy. 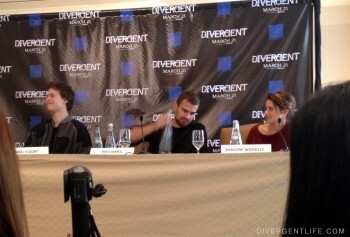 Then our next interview was with Ansel. 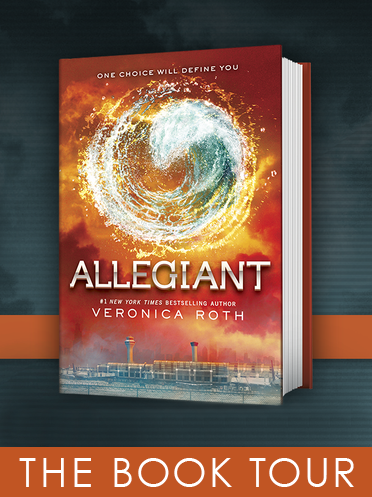 He told us what it’s like to be a part of such big book to movie adaptations, tactics to surviving a zombie apocalypse, and the Divergent soundtrack. 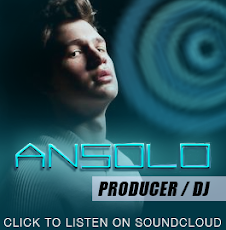 He says he’s hoping to have Ansolo on the Insurgent soundtrack and will be releasing some new songs next month on a record label. By this time, Shailene Woodley, who plays the lead character Tris, and Theo James, who plays Four, have arrived on the red carpet, doubling the excitement. Between talking to the press, the stars also signed lots of autographs and took selfies with fans. 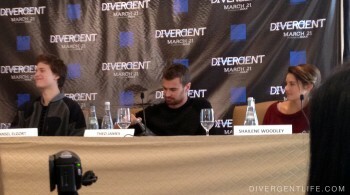 Our interviews with Theo James and Shailene were much shorter because their time was more rushed having arrived later and spending so much time with fans. 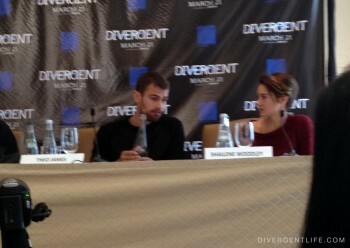 Theo told us about his favorite scenes and his opinion on the soundtrack. 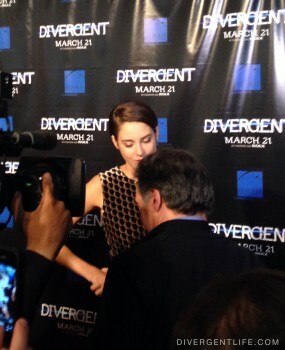 Shailene talked about the most challenging scene for her to film and why. Some fan highlights I saw happening was a girl with a sign saying “I’m factionless and it’s my birthday!” got tickets for the movie from Ansel, Shailene spent some time talking with a girl who was in a wheelchair and the smile on the girl’s face was priceless, and some fans brought Ansel a cookie cake! 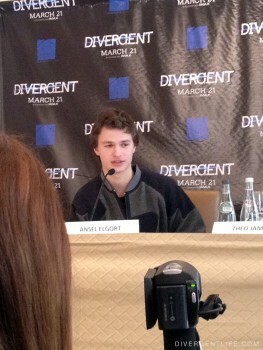 A big highlight for me was when Ansel remember my name from the first two times we met! After all the craziness of the red carpet, we went to the theater for the screening. 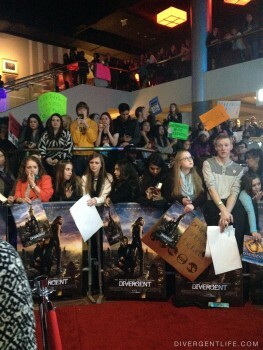 The whole theater was packed with fans, with many of my friends who also did press sitting in the same row as me. The movie was scheduled to start around 8:00, but the red carpet lasted till about 8:45 and the movie started about 9:00. 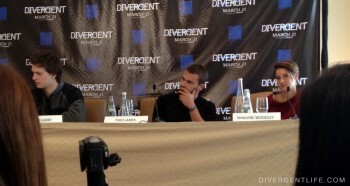 When we saw the title come on the big scene, the audience erupted in applause. The thing about seeing the movie with other people who have also read the books and are passionate about it, is that we would cheer at the good parts, swoon at the shirtless Four scene, and experience all the feels together. 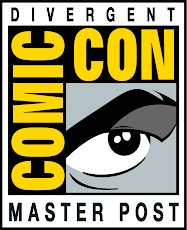 What a crazy couple of days it had been! 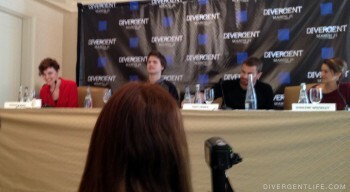 I can never express how grateful I am to DivergentLife.com for the opportunity to represent them at these events. 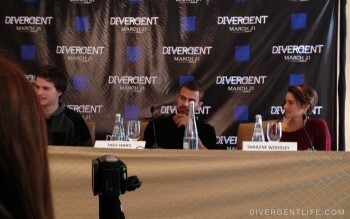 I continue to fall more and more in love with the Divergent fandom with all the great events I attend and the fantastic fans I meet! - Big thank you to Sylvia for all her help, for representing us, (and with that fabulous hair), and most importantly- for having a great time! Thanks pagetopremiere sasha for recording.